Sometimes, I like to think about how things would be if I made different decisions. Like, if I had never decided to buy the PlayStation 2, my first venture outside my previously Nintendo-only domain, what games would I be playing now? What would my collection look like? I’m sure we all have times where there is a great game we didn’t plan on getting, but we ended up playing it because of what a friend said about it or because it caught our attention in the store during a search for a completely different game. And when this happens, I often think about how close I came to missing out on such a good game. And maybe we all do that, or maybe it’s just me. Because I think too much into things sometimes. And when I get to thinking, I realize all manner of things. If I didn’t just happen to spot “Okami” and “Vexx” and decide to give them a try, I would have missed out on some fantastic games. And “Portal 2”, actually, was thanks to good things Cary and Hatm0nster said about it, or I would have never bought the game. (Thanks, guys.) Seriously, I saw it in the stores, and all I thought was, “That game sure has a weird cover”, and that was that. Then, I heard people talk about this game, looked it up one day, and there it was, a game I had seen before and just simply passed by. Small world. Or just, small video game section of the store. I dunno. But, it’s weird. Also, thanks to more good reviews on blogs I’ve read, I bought “Chrono Trigger” and “Chrono Cross”. Never heard of those games before, but now I own them, and I really look forward to playing them. And so I thought I’d just recount a few weird little situations that led to me getting some games I now couldn’t live without. One involves the “Jak and Daxter” series. I had bought the first “Jak and Daxter” game, “The Precursor Legacy”, and loved it. Well, to be honest, when I first played it, for whatever reason, I didn’t like it. I know, weird. I loved it at first. I thought the characters were hilarious, and I thought to myself, this is really going to be something. And then shortly into the game, I got to the Forbidden Jungle and kept getting killed by those weird snakes that hang down from the trees, out of, apparently, sheer clumsiness (as I now have no trouble whatsoever avoiding said snakes), and I began to like the game less than I had before. I think part of my gripe with the game was how you had to collect so many darn globs of Green Eco just to get one unit of health back, an especially annoying aspect to a game where I kept getting assaulted by stupid snakes. Strangely enough, I got through the game, and I suddenly had this huge urge to play it again. And I did, and I loved it. And yet, when I heard that a sequel had already come out, “Jak II”, I didn’t have any desire to get it. No idea why. And then one day, I heard about the future release of “Jak 3”, and I saw an image that brought about a lot of speculation. There was this picture of a Precursor robot, which was what the villains from the first game, Gol and Maia, used to fight you in the final boss battle. I, like many other fans, believed this was proof that the two evil siblings would return in “Jak 3”. I loved those two, and I became quite excited to buy “Jak 3”. And so right after it came out, I did, and the entire time playing through it was one of the most exciting things ever because I just knew Gol and Maia would show up at one point. Long story short, they didn’t, and I was pretty disappointed. I didn’t end up being a huge fan of “Jak 3” (not just because of my hopes being dashed, but that may have played a part in it), as the game, while being a really great game, was rather boring once you got farther into it. I know it’s contradictory, that I found the game to be awesome and boring at the same time, but it was. Nevertheless, I decided to buy “Jak II”, which I just happened to find in one of those sections of Wal-Mart where all the old, unsold games go, and I loved it. I loved that game so much, and while it’s not as good as the first game (that’s a pretty hard game to compete with), “Jak II” was still my second favorite of the series. Just think, if that rumor about Gol and Maia hadn’t come up for “Jak 3”, I may have never ended up getting “Jak 3” and, in turn, “Jak II”. Close call. And then one more story of weirdness. I loved “Sonic Adventure 2: Battle”. It was my first “Sonic” game, and finding my first “Sonic” game to be such a great game, I kept buying “Sonic” games in the hopes that they would compete with this most fantastic of games. Honestly, I have never found a “Sonic” game as good as that one, but for quite some time, my search, nonetheless, continued. And then one day, years later, I found that this game had two supposed sequels, “Sonic Heroes” and “Shadow the Hedgehog” (which really are barely sequels at all, especially the former, but I get ahead of myself). Being very interested in Shadow’s story involving him and the young woman Maria in “Sonic Adventure 2: Battle”, I bought “Shadow the Hedgehog” first, which was not that great. Then, I considered getting “Sonic Heroes”. I saw it new in Best Buy, but I kept not getting it. And then, one day, a few things happened. I thought I might just get the game, after all, and…I really wanted a “Final Fantasy VII” game. That’s right. At the time, I really wanted to play “FFVII” and see how great it was, but it was hard to find and cost quite a bit when I did find it. There was, however, a “FFVII” game on the PS2 called “Dirge of Cerberus”. I didn’t know how good it would be, but I wanted to get some kind of “FFVII” game, even if it wasn’t the original. I went to Best Buy first to pick up a new copy of “Sonic Heroes”, but by then, it had been sold out, so I went to the game store. Here, I found that they just happened to be having a great sale this day, where, if you bought two used games for the PS2, XBox, or GameCube generation, you could get two free. That’s right, you could basically walk away with two free games! Now this was a great deal! It was like fate! So I got a used copy of “Sonic Heroes” and “Dirge of Cerberus”, and then I began my search for my two free games. I looked for quite some time, finding nothing that looked interesting. But, I may as well get something, no matter how bad it looked, as it was free, after all. Finally, I stumbled upon a series I had all but forgotten about, the “Ratchet and Clank” series. I already had the second game of the original trilogy, but I didn’t have games one and three. Perfect. I chose those as my free games, and I was on my way. Well, little did I know that the best games I was getting were the ones I didn’t even come to the store for. “Dirge of Cerberus” turned out to be fun, but was still not a great game. I then had to buy a new copy of “Sonic Heroes” from Amazon, as the one from the game store was badly cracked. Also didn’t end up being as good as I expected. And then I just didn’t trust the condition of my two “Ratchet and Clank” games. They were in strange shape, and I worried they’d crack while I was playing them and damage the PS2. I still ended up playing the first “Ratchet and Clank”, and it was okay, but I couldn’t bring myself to put the PS2 at risk again for the third “R&C”, so I just held onto it, but didn’t actually play it. A year went by, and I decided to buy brand new copies of both of my used “R&C” games from Amazon (it was no wonder they were giving these games away; I had to buy second copies of three out of four! ), and I finally played the third “Ratchet and Clank”. And you know what, it was awesome! I loved the game. It became one of my favorite games of all time, plus it introduced me to the villain, Dr. Nefarious, who I found to be one of the greatest characters ever. Finding out that this series had sequels on the PS3, I then bought the PS3 and the new games, and that is the point of my post. If I didn’t go to the game store during that sale, in order to get two completely different games, I may have never given the “R&C” series another chance. I did enjoy the second game, but for some reason, I never had any desire to get the others. But, that sale gave me an easy opportunity to try the series again, even if I couldn’t play all the copies I bought there. If it weren’t for those events, I may not have bought a PS3, and I very well would not have become a huge “R&C” fan like I am now. Isn’t it weird how little choices can make such a big difference? And since Cary and I decided to trade posts for Voluntine’s Week, this post can also be found on her blog “Recollections of Play”. Go and check out her great blog, because just as it’s no fun missing a great game, it’s no fun missing a great blog, either! You and my fiancé have eerily similar taste in games! I was a Sega kid so my intro to Sonic was much earlier in the series than your first game; so I was just curious, have you gone back and played older Sonic games and do you have a favourite? I have indeed played the older “Sonic” games. I bought “Sonic’s Ultimate Genesis Collection” for the Xbox 360, which had a bunch of “Sonic” games, including “Sonic the Hedgehog” 1-3 and “Sonic and Knuckles”. 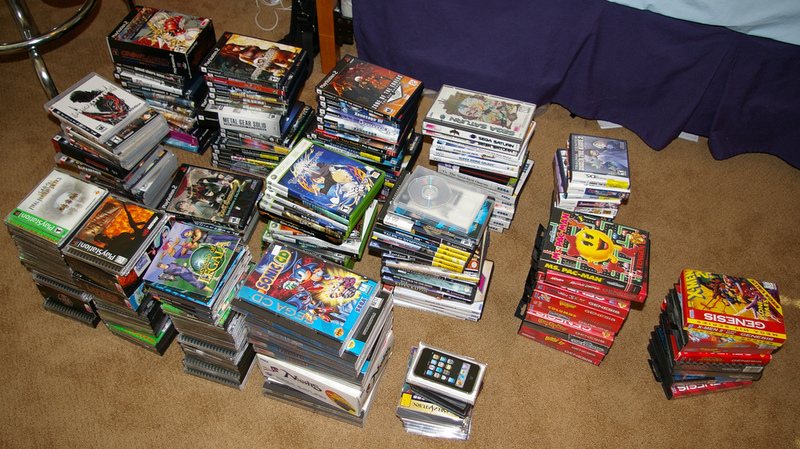 As many old games are, they were quite difficult for me, and I usually was unable to get super far into them. I was, however, able to reach the final boss (but not beat it) in “Sonic the Hedgehog 2”, so I believe that one’s my favorite, as I got to experience more of it than the other games. And playing as Knuckles in “Sonic and Knuckles” was pretty fun, too. Sonic Adventure 2: Battle is grossly underrated in my opinion. Sure the Knuckles/Rouge stages and the driving is awkward. But the sheer variety in gameplay and the wonderful sensation of speed in the Sonic/Shadow stages was simply the best! (also, CHAO!!!) This is my favorite Sonic game (even after having grown up with the Sega Genesis classics) and fully completing it with a friend of mine remains my greatest triumph and gaming tragedies: First I lost my championship chao (It won all the races AND could not be beaten in chao battle), and then the memory card my perfect save was on got corrupted. “Sonic Adventure 2: Battle” was simply awesome. I have a really awesome Chao, too, that has really high stats. I named it Nayru, and it wins everything. Sometimes I just have it enter races and battles just to watch it annihilate the competition. In the races, it just speeds ahead of everyone else. In the battles, one punch, and its opponent is defeated. (It makes me a little said watching a Chao get punched in the face like that, though….) I also like to put it somewhere high so that, when it falls off, I can watch it fly. It’s quite good at flying, too. It’s a shame your save file got corrupted. Those Chao can take a long time to make strong. I don’t know what I’d do if I lost Nayru or my favorite, Rocky. Rocky is the world’s cutest Chao. My dad actually bought home a SNES, too. He won it at work or something, and my mom thought it was a silly thing to bring home, but we all ended up loving it. We had great times with games like “Donkey Kong Country” and “A Link to the Past”, as well. Still fantastic games.